Asked last month who's side Nick Fury would be on in Captain America: Civil War, Samuel L. Jackson almost seemed offended by the question. In fact, he refused to answer, saying that kind of internal conflict was 'above' the character. And as it turns out, the actor's gut reaction was right. Nick Fury had no dog in this fight between Steve Rogers and Tony Stark. And that's the main reason we didn't see him show up, even for a second, in this blockbuster sequel. Nick Fury joins Hulk and Thor as the trifecta not invited to play in the big Civil War sandbox, which unites and then tears apart every other Marvel character introduced thus far. Heck, it even gave us two new ones in Black Panther and Spider-Man. It would have been easy for Nick Fury to have gotten lost in this sea of swinging fists. Even if he is the one responsible for bringing all of the Avengers together in the first place. Some fans have been confused about Nick Fury's absence, though. It feels like Samuel L. Jackson's fan-favorite character should be involved in the introduction of something as important as the /captain-america-civil-war-sokovia-accords-photo/Sokovia Accords. But screenwriters Christopher Markus and Stephen McFeely disagree. Speaking with The Los Angeles Times, McFeely admits his just as curious as everyone else as to where Fury is hiding during all this. But Markus has an answer. "We called him, but he let the line blink. Primarily it felt like one too many possible opinions. We didn't want him to take one side or the other, because that's not his place in the universe. And then we didn't want another, "Is he still with the government? Is he opposed to the government but supporting the government?" It got to be the potential for a lot more polemic discussion that the movie did not have room for. He's the guy who put it together. He's been the sort of parent figure to the Avengers. Let the parent go away, and see if the kids can handle this. See if the kids can be who they're supposed to be without that governing voice. Um... and they didn't do that good of a job." 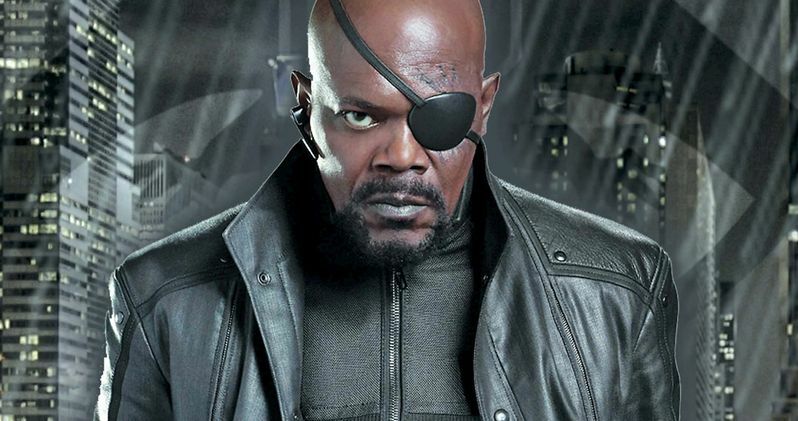 It isn't exactly known how many more Marvel movies Samuel L. Jackson is signed for. But he said that he'll return in Avengers: Infinity War. The two writers seem to agree with that claim. At this point, it's just assumed that every character and then some will show up at some point in Infinity War. Explains McFeely. "Don't you assume you'll see everybody in the "Infinity Wars?" You heard it here first: Everybody is in "Infinity Wars." Hopefully that includes Sam Rockwell's Justin Hammer and Whiplash's bird." Christopher Markus and Stephen McFeely are writing Infinity War right now. They claim they've been locked in a room, trying to hash out the story beats for a massive adventure that contains over 60 main characters. They are still in the early draft stages. The movie is rumored to have a fight scene that will bring all of these characters into one glorious battle, making the airport fight scene in Civil War look tame by comparison. Though, they are the first to admit this is an extremely complicated undertaking. Says Markus. "Explaining quickly something that is going to be just completely incomprehensible to the average person is a tough one. [I'm] heartened by the popularity of things like 'Game of Thrones' where even the people who read the books and really love the show don't always know what's going on. Knowing 100% what a warg is, it's not essential to the enjoyment of the show." The duo point out that even if you loved the Winter Soldier comics, they weren't entirely beholden to the source material, taking needed liberties here and there. And this time, the two writers aren't limiting themselves in terms of scope or scale. It's everything goes. And what makes it on screen will be the best of these flights of fancy they are currently playing with. And one of those flights will surely include Samuel L. Jackson's Nick Fury.